There is nothing better than getting away to a romantic cabin in Gatlinburg. 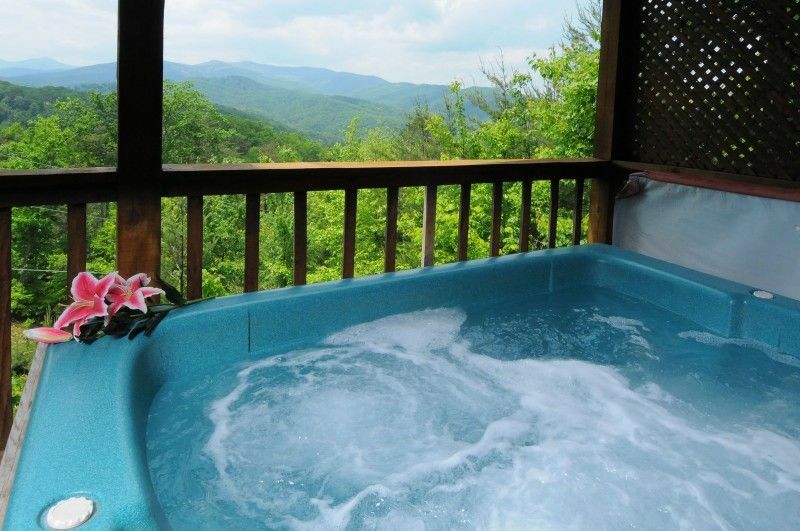 There is nothing better than getting away to a romantic cabin in Gatlinburg. Enjoy the incredible panoramic mountain views from this 1000 sq. ft. cabin with a loft king master bedroom & covered deck with hot tub, outside gas fireplace and charcoal grill & rockers. Also enjoy a fully equipped kitchen, living room with wood burning fireplace, and two cable TV's. You can take advantage of the DVD player in the living area too, which also features a stereo CD player. Step into the beautiful loft king bedroom with a "heart" shaped Jacuzzi and full bath. Have some fun in the game room with the regulation pool table. Lots of natural wood inside makes this romantic cabin in Gatlinburg the place to enjoy the fantastic mountain views. Located just minutes from downtown Gatlinburg, this cabin is near all the fun things to do like shopping, dining, and sightseeing. Other amenities include high speed Internet (ethernet cable) and unlimited local & long distance calling. Make Tina Marie's your special Gatlinburg getaway cabin rental. Fantastic views total seclusion and very close to all the activities in the area. The cabin was just what I needed . The cabin was just what I needed after a long 10 day work stretch. It was cozy and clean. The hubby and I stayed on the back deck most waking hours either enjoying our morning coffee or relaxing in the hot tub and then staying warm by the propane fire pit with a cooled glass of wine. It rained a little during our stay and was cloudy but even the rain clouds with all their variant greys and whites with a little soft blue in them were beautiful..While inside the cabin we enjoyed the crackling fire while watching movies. It was a wonderful soothing stay. We hope to come again. We spent five nights over Christmas in this property, and I must say it was just about perfect for us. We arrived after dark, but when we awoke the next morning to the view with clouds rolling over the valley below, it was breathtaking! The weather was perfect to enjoy the hot tub on the patio at night. The size, amenities, and location were perfect for exactly what we needed, which was a relaxing holiday. It was our first trip to Gatlinburg. We'll definitely be back, and would be love to stay in this cabin again! we appreciate your comments on Tina Marie's and look forward to seeing you again in the future. We had a great time and would do it again. We appreciate your comments on Tina Marie's. The cabin was clean and just the perfect size for a relaxing getaway weekend. The view of the snowy mountains were georgous!!!! Be cautious of the driveway though, it is a little scary!!! We can not wait to visit again!! I really loved this cabin. I stayed the week of Thanksgiving and walked into a cheery holiday decorated place. It was everything I was looking for. Quaint, quiet and cozy, everything you could want in a cabin, with spectacular views to wake up to every day. I would stay here again in a heartbeat! We appreciate your comments on Tina Marie's and look forward to seeing you in the future.